The Minnesota State Canvassing Board met today, at 9 AM CT, to finalize all challenge resolutions. Each campaign brought forth a series of ballots that were believed to have been inaccurately allocated. At the end of the day, Franken gained 6 votes and Coleman added 2 for a net Franken gain of 4 votes. This addition extends Franken's lead to 50. Marc Elias: And now with everything except for the absentee ballots counted we are leading by 50 votes. We could not be more thrilled with where we stand, in this process. This recount has gone exceptionally well. Marc Elias: At every stage we have gained votes. And we have every reason to believe that will be true of the absentee ballot review as well. As you know we made an offer to accept all thirteen hundred and fifty of them, because we are confident that if all those were counted we would gain even more votes. Tony Trimble: The Canvassing Board, as we all know, has not taken care of the duplicate voting, the double voting thats occured in Minneapolis. We are faced with an artificial Franken lead, of a, double digits is all. There were a hundred double counted ballots, actually a hundred and ten doubled counted ballots that will wipe out that lead and keep Coleman, justifiably in front. That's where we stand today. Reporter A: If you have that faith in local officials, why are you not accepting their list of the thirteen hundred? Tony Trimble: We have faith in local officials, they're going do the right thing. But we have brought to their attention, and the Franken campaign's attention, that there is another stack, a small stack ten to twelve thousand that ought to be reviewed. And we have faith that they will produce those, and show those to the Franken folks [so that they can agree]. Mark Ritchie: To my knowledge neither of the campaigns even attempted to get agreement from the other campaign to meet this requirement. So as of three o'clock yesterday this agreement made by both campaigns, the local elections officials, and our office was that by three they had to have agreement by both campaigns to add any additional challenges. It is not that complicated of a rule. It is under the order of the SC of MN. Its a very straight forward thing that's fairly easy to read and interpret. If anybody would like to ask for further clarification on whether this rule should be changed they should say that, but that's a different thing than saying the rule does not exist. Reporter A: So the rules says that after 3 PM you cannot add to pile 5, except by mutual agreement. The only remaining step, for the Canvassing Board, revolves around acknowledging sum potential 1,350 wrongfully rejected absentee ballots. The board will meet on January 5th and 6th from 2:30 to 5:00 PM CT. During this time, the five member committee will review the challenged absentee ballots before they allocated. It is possible, perhaps even probable that on January 6th the State Canvasing Board will declare that one of the candidates has received the most votes. This is not to be confused with an election certificate. Acknowledging the receiver of the most votes does not imply certification. Once it is known who received the most votes, the loser may request an "election contest" within seven days. If a contest does occur, the winner is officially certified after the resolution of that contest. If there is no contest, the winner is certified seven days later. Minnesota will not have a second Senator on January 6th, the would-be day of admittance. The following conversation occurred last Tuesday, December 23rd, after the State Canvassing Board adjourned, but before the Minnesota Supreme Court convened that afternoon. This pseudo-press conference involved two members of Coleman's legal counsel; Fritz Knaak and Tony Trimble. Summary: The Coleman campaign believes there are about 20 allocation errors pertaining to the challenged ballots that will directly benefit Coleman's vote count. They believe that the Franken campaign has issues with just a third of that number. Fritz Knaak: We're quite confident they just missed a few. Tony Trimble: We provided to the SOS and the Franken campaign today with a list of 20 ballots that were allocated incorrectly. They have quite a task ahead working on the spreadsheet with some sixty six hundred ballots to allocate and so over the weekend it's not to be unexpected that there might be a few clerical mistakes. But we have located 20 clerical mistakes in which votes that should have been allocated to Norn Coleman, err Senator Coleman where instead allocated to the other column meaning Barkley or another candidate. And also a handful that were allocated to Franken and of course if you deduct, redact the Franken vote and put it in the correct vote one which is the Coleman vote that's a two vote gain right there. That's a substantial correction and you'll note that the Franken campaign had a very very tiny list of reconciliation that they submitted today; not even a third of the size of ours. We picked up a goodly number of votes today just on reconciliations, so far. Reporter B: How many ballots or still in your reconciliation pile? Tony Trimble: We're still going through that, we submitted 20 today. But there is another dozen or so that were crosschecked and of course both campaigns, this is not done yet, both campaigns are scouring the list, as they should, to make sure that the count, at least the allocation of these challenges rolls was made correctly. The next quote picks up where the last quote ended. Summary: The Coleman lawyers seem to have a disagreement regarding the release of some internal information. Tony Trimble starts to answer a question, but is semi-interrupted by Fritz Knaak; Tony Trimble then states that there are two or three challenges that were allocated to Franken that should be allocated to Coleman. Apparently Fritz Knaak did not want this count to be public knowledge. The Coleman campaign still believes they can overcome the StarTribune reported 47 vote discrepancy; the StarTribune is now reprting a 46 vote lead for Franken. Reporter C: How many are there of the two for one variety? Tony Trimble: it was a, two or three at least. Fritz Knaak: We're expecting more. Understand that this is an ongoing process and we're, I think we're mostly done but a, at this point the staff is still working through these. Reporter D: Is it enough to overcome the 47 votes? Tony Trimble: We sure think so; we were quite pleased with the results from last night's review. The following quote preceded the two already listed, by about three minutes. No summary required. Reporter A: Can you win without a favorable decision from the supreme court? Fritz Knaak: Yes we can. The decision by the Minnesota Supreme Court today virtually guarantees two things in this recount. One: it ensures that there will be an election contest because Minnesotans simply will not support an election as close as this being decided by some votes being counted twice. Two: this ensures that no certificate of election will be issued due to an election contest inevitably being filed, leaving Minnesota without two sitting United States Senators on January 6th. Thus, one of two things occured; either something caused their internal count to change (which we'll never know, because they don't release that information), or the Coleman campaign never actually thought they could win, without the need for an election contest, based upon the challenged ballot returns. In either case we'll all find out more tomorrow, when the State Canvassing Board meets again at 9 AM CT to finalize all 6,688 challenge resolutions. I think its fairly safe to say that the Coleman campaign believes they will lose amongst the rougly 1,600 yet to be counted absentee ballots based upon their already announced intent of challenging, what they perceive to be, the outcome of the recount. But our denial of the relief requested does not constitute a binding determination in a subsequent election contest proceeding. Unless I am mistaken, which I very well could be (I'm not a legal expert) why couldn't the Coleman campaign just take their petition to an "election contest proceeding?" This ruling appears to be good news for Franken, but I'm not certain the issue is actually resolved. From a legal standpoint Coleman is helpless, at least until a winner is certified; as an "election contest" implies contesting the result of an election after a winner has been certified. The State Canvassing Board could require that each county double check their count to try and preempt any such election contest, but even then an election contest seems likely. Here's an audio recap of the recount events that took place today. The audio isn't great, but the content is still discernible, despite some obvious background artifacts; the time is presented as HH:MM:SS. Coleman's Counsel: We see the number as much better from our point of view. We'll know more after we've had this dialogue with the Secretary of State. Reporter A: What's your internal count at? Coleman's Counsel: Our internal count is a, something we don't share. Reporter B: Why is that? Coleman's Counsel: Because we don't, as a matter of policy; very early on we decided. There are essentially only two reasons why they don't want to reveal their internal count. The most likely scenario is that their internal numbers actually show that they are trailing; and secondly they simply do not have an internal count. I find the second option very unlikely, basically impossible. The campaign has demonstrated no restraint when it comes to declaring victory. I think if they thought they were winning, we would all know that they thought they were winning. Hence because they are not stammering about their lead, they are in fact, not in the lead. Reporter A: Is it almost certain that there is not going to be a winner certified by January 6th, when they're supposed to be sworn in? Is that being taken into consideration? Sec. Mark Ritchie: Absolutely not a consideration. I have until November 2010, personally. The 5th and 6th [of January] we have scheduled from 2:00 to 5:30 both days [for the canvassing board to meet]. Reporter B: Can a winner be certified by January 6th? Sec. Mark Ritchie: If the stars align...Our top priority is accuracy and transparency. And the timing thing is just not our issue. You know I want to put an underline: we don't care as long as it's accurate and is done in a transparent way. Supreme Court Justice: Where have you shown to us, that there is, there are [more] votes counted in any given precinct than the number of voters as would be determined under §204C.20. I personally find it very likely that the petition, as put forth by the Coleman campaign, will fail; but I am not a great supreme court mind. My verdict is based entirely on my interpretation of the proceedings. The entire proceeding can be watched live, at TheUpTake.org. 9:25 AM CT: The board is discussing the possibility of going back into the pile of challenges to re-review some questionable ballots. There are apparently 16 ballots that were marked with an X; from these 16 ballots, the board discerned that the X was written in a "different ink," or on a different plane (above or below another mark) on the ballot. 9:31 AM CT: The board is now considering whether to actual "pull" and review those ballots. Apparently it would result in reviewing 40 total ballots due to the comparisons requested; the clerk estimated that the review would take about half an hour. 9:33 AM CT: If they review those 16 ballots, as requested by the Coleman campaign -- which would require 40 total ballots to be reviewed -- the Franken campaign has argued that they also have a select group of ballots they would like to have re-reviewed. 9:35 AM CT: An hour long recess is forthcoming as they sort through the challenges and "pull" the 40 ballots in question. Recess until 10:30 AM CT.
9:47 AM CT: On a side note; Coleman counsel, Fritz Knaak was just semi-complaining about the recess. After the recess, Mr. Knaak preceded to the back of the room to get his get something in his laptop bag. On the way, a member of the audience asked Mr. Knaak if "[he] got paid" for waiting. Mr. Knaak responded by saying, "wait, its what lawyers do." At the same moment in time, Franken counsel, Marc Elias was talking with a group of about four people who were laughing. Bottom line: Knaak is nervous and Elias seems at ease. Justices are elected to six-year terms unless a mid-term vacancy occurs, in which case the governor appoints a replacement to finish the term. Justices have a mandatory retirement age of 70. The two justices who are member of the canvassing board must abstain from participating, from the bench on any item related to the recount. That leaves five judges, two liberals, two conservatives, and an independent to decide on the double balot issue later today at 2 PM CT.
10:32 AM CT: Meeting reconvenes. The Coleman campaign has asked the board to compare their decision on a challenged ballot to that of other challenges. 10:33 AM CT: A motion is required to even begin reconsidering a ballot. 10:39 AM CT: The first two challenged challenges fell without a second motion. 10:45 AM CT: The board has yet to acknowledge a desire to reconsider any of these challenged challenges. 10:52 AM CT: The board still has not seconded a motion to reconsider their decision. A lot of the challenges in question have pertained to unanimous decisions by the board. I'll post the document containing the specific ballots later. 10:57 AM CT: All 40 ballots were reviewed and nothing happened. The board then sarcastically remarked that they would not acknowledge similar challenges from the Franken campaign. 10:59 AM CT: Recess until 9 AM CT on December 30th. They will validate their challenge counts. The Supreme Court will convene at 2 PM CT to tackle the issue of doubly counted ballots. Check back for live coverage. Update [8:29 PM CT 4/17/2009]: I updated the bio of Justice Paul H. Anderson to reflect the fact that he was originally appointed to the bench, not elected, as previously stated. The State Canvassing Board will meet tomorrow morning, at 9 AM CT, to finalize the allotment of all challenges. For now however, based upon this initial draft, Franken has taken a 48 vote lead. The only ballots left to count or perhaps uncount, are the wrongfully rejected absentee ballots and a few ballots that were possibly double counted. The MN Supreme Court will meet tomorrow at 2 PM CT to tackle the issue of the duplicate ballots. The State Canvassing Board's discussion will be streamed live via TheUpTake.org starting at 9 AM CT. The final day allocated by the State Canvassing Board for the review of challenged ballots started today at 9 AM CT. The proceedings can be watched at the Minnesota House of Representatives Website (as shown below) or at TheUpTake.org. Yesterday, the board reviewed 468 of the 1,017 challenges put forth by the Coleman campaign. Based upon these figures, 549 challenges remain, that must be reviewed by the canvassing board before the conclusion of today's session. There are however still challenges outstanding; those challenges will be reviewed on December 30th by the State Canvassing Board. The already withdrawn challenges will be included into the count on Tuesday, December 23rd. The Minnesota Supreme Court will also meet on Tuesday to discuss the duplicate ballot issue. Day 2 of the challenged ballot review process was restarted this morning at 9 AM CT, by the five member Minnesota Canvassing Board. The proceedings can be watched at the Minnesota House of Representatives Website (as shown below) or at TheUpTake.org. A full recap of yesterday's event is available, along with a full video replay of the proceedings. Today, the Board decided that a series of ballots to which we had withdrawn our challenges should be counted in a certain way. In order to achieve consistency in votes counted for voter intent, we are reinstating a portion of our initially withdrawn challenged ballots to protect our rights and the concept of voter intent. There has been no further word from the Franken campaign regarding any challenge withdrawal or additions. 3:50 PM CT: Break time for the panel, Coleman challenges to start at 4PM CT.
4:06 PM CT: Discussion on duplicate ballots. 4:11 PM CT: Challenge reviews are done for the day. 4:50 PM CT: Meeting adjourned to reconvene tomorrow at 9 AM CT. The State Canvassing Board has begun the tedious process of reviewing the challenged ballots from the Minnesota Senate Recount. The proceedings can be watched at the Minnesota House of Representatives Website (as shown below) or at TheUpTake.org. The Franken campaign today announced that it would withdraw another 750 ballot challenges, bringing the total number it has withdrawn to over 1800. With that in mind, it is our intent to reduce our challenges to somewhere south of 1,000 ballot challenges by the time the board meets on Tuesday. It is our hope that prior to the Canvassing Board meeting the board and the Secretary of State will have a credible process that is both uniform and consistent for reviewing challenged ballots. Two days after members of the state canvassing board issued an urgent plea for campaigns to withdraw additional challenges in order to allow them to finish their work in a timely fashion, the Franken campaign today announced that it would have fewer than 500 challenges remaining by the time the board meets on Tuesday. Depending on who you believe, or which count you use, a plethora of challenges, by both campaigns, still must be reviewed by the five member canvassing board. The review process started at 12:00 PM CT today, after a delay, and intends to conclude on Friday the 19th. The Canvassing Board has concluded reviewing ballots, for today. After the final ballot was reviewed they went on to talk about the need for each campaign to further reduce the number of challenges brought to the board. The board reviewed 159 challenges put forth by the Franken campaign, and a single challenge by the Coleman campaign which was mistakenly in the wrong pile. Coleman's challenge was overruled and the vote went to Franken. The nomination of retired Army Chief Gen. Eric Shinseki to be secretary of veterans affairs is widely seen as an appointment with a message, since Shinseki ran afoul of former Defense Secretary Donald Rumsfeld. But CNN Senior Pentagon Correspondent Jamie McIntyre has the inside story of how Shinseki's reputation as a "truth-teller" has been burnished beyond what the facts support. In fairness to Gen. Eric Shinseki, he's never said "I told you so." What does that even mean? Seriously. Either Jamie is implying that Gen. Eric Shinseki was wrong, which in itself is wrong (more on that later) or Jamie is saying that Gen. Eric Shinseki wasn't arrogant enough to boast, thus implying that he was right. In either case Jamie is wrong. But many others have elevated his now-famous February 2003 testimony to the level of Scripture. And if by "Scripture" you mean that Gen. Eric Shinseki's foresight regarding the Iraq invasion and subsequent occupation were correct, then yes; otherwise no. Shinseki was right, they say, when he told the Senate Armed Services Committee a month before the invasion that something on the order "several hundred thousand troops" would be necessary to keep order in a post-invasion Iraq. Thank you for proving my previous point, Jamie. At the time, that observation drew loud scoffs from then-Defense Secretary Donald Rumsfeld and from his deputy, Paul Wolfowitz, who dismissed the prediction as "wildly off the mark." Still, Shinseki wasn't advocating 300,000 troops be dispatched into Iraq. In fact, he said specifically that the forces mobilized in the region to that point were probably enough, and he made it clear he would have defer to the combatant commander, Gen. Tommy Franks. "I would have to rely on combatant commanders' exact requirements," he said. But pressed by Sen. Carl Levin, D-Michigan, to make an off-the-cuff guesstimate, Shinseki said "it would take a significant ground force." Okay? What part of "something on the order of several hundred thousand soldiers are probably, you know, a figure that would be required" to invade Iraq, is so difficult to comprehend? Shinseki absolutely supported a ground force of at least 300,000; I would say several implies at least three as couple typically denotes two. Since that day, critics of the war have lauded Shinseki's prescience and his willingness to speak truth to power. "Here was a career officer who had valuable insights who was shunted aside by arrogant civilians," University of Michigan history professor Juan Cole is quoted as saying in Sunday's Washington Post. "When he had his disagreements with the administration, he wasn't afraid to speak up," Vietnam Veterans of America's John Rowan told CNN on hearing of the nomination. It's an appealing narrative, but the facts as we know them are not nearly so complimentary to the retired Army chief. Let's see the "facts" then Jamie, so far neither Prof. Juan Cole nor John Rowan have said anything disputable. You see, Shinseki never made any recommendation for more troops for Iraq. In fact, as Army chief of staff, it wasn't really part of his job to take part in direct war planning. If it wasn't part of his job, why would you expect him to do it? But as a member of the Joint Chiefs of Staff, he did owe the president his best military advice. And if he felt strongly enough that the advice was not being taken, he could have resigned. So let me get this straight Jamie, you're suggesting that one of the few Generals with any say in any military planning, who was ultimately proven to be correct about his pre-war assertions, should have resigned because the President ignored his advice. Unbelievable. According to senior military officers who were in the pre-war meetings, Shinseki never objected to the war plans, and he didn't press for any changes. Wait, if "it wasn't really part of [Shinseki]'s job to take part in direct war planning" why was he in "the pre-war meetings?" When the joint chiefs were asked point-blank by then-Chairman Gen. Richard Meyers if they had any concerns about the plans before they went to the president, Shinseki kept silent. Jamie, you've already stated that Shinseki believed "it would take a significant ground force" to invade Iraq. Did you want Shinseki to stand up and say this is a bad idea, we need more troops? It wasn't his job, as you previously mentioned, and his views were clearly understood and already ignored by all those involved. But Shinseki was a very private leader who did media briefings only when ordered to and rarely gave interviews. If he had concerns about the Iraq war plans, he kept them to himself. He admitted as much in a rare e-mail exchange with Newsweek magazine in 2006. Asked to respond to the criticism that he failed to push to stop Rumsfeld from going into Iraq with too few troops, he told the magazine, "Probably that's fair. Not my style." Knowing his opinions were not particularly welcome, Shinseki kept his mouth shut. In that sense, he was "marginalized," as some say. Again Jamie, you prove my point, and contradict your own. Nobody had anything to gain from Shinseki's contining vocalization of his views. The war was still going to happen in whatever manner Rumsfeld and Bush wanted it done, and I would rather have a General who was correct and silent (Shinseki) than a General who was loud and wrong (possible replacement had Shinseki resigned). And it's true that in retrospect, many U.S. commanders believe there should have been more troops sent to Iraq, even though it's far from clear that would have prevented the insurgency and sectarian violence that the Pentagon failed to anticipate. But the idea that Shinseki was a strong advocate for a bigger force and that no one listened vastly overstates his role. It's one of those Washington myths that are almost impossible to dispel -- like the popular misconception that Shinseki was fired for standing up to Rumsfeld. That myth is so pervasive, the authoritative Associated Press repeated it again Saturday night, saying "Shinseki was removed from [his] post after challenging the Bush administration." He did not stand up to Rumsfeld, nor was he fired. Nobody is overstating Shinseki's role. Perhaps you are understating the gross incompetence of the Bush Administration's planning of the Iraq War. Shinseki may not have been removed from his post but there was definitely contempt from Rumsfeld. Shenseki's retirement took place just 4 months after his preceding testimony. At Shinseki's retirement ceremony, no senior civilians attended breaking an historical precedence. I'll also point out that the AP is garbage, go ahead and find another source propagating this "myth," and get back to me. There's no question that Shinseki was on the outs with his civilian bosses, especially Rumsfeld. Shinseki ordered that all soldiers wear black berets, a move that infuriated the special forces community, for whom the berets were a badge signifying their elite status. Rumsfeld, according to aides, was particularly miffed that Shinseki spent so much effort changing the Army's head gear, when the nation was at war. He retired after serving a full four years as chief at a ceremony in 2003 that neither Rumsfeld nor Wolfowitz attended. In a briefing carried by CNN, Shinseki stated that "The Army will change to remain the most capable and the most respected Army in the world." Deputy Defense Secretary Paul Wolfowitz then went on to say that "[Shinseki & Wolfowitz] thought it important to have a symbolic and a visible demonstration that this Army was prepared for change and undertaking it." Both were commenting on the inclusion of the black beret into the Army uniform. It seems as though Rumsfeld was more concerned with physically waging war than he was with supporting the operations of the US Army. In announcing Shinseki's selection as secretary of veterans affairs, President-elect Barack Obama called him someone who "always stood on principle." "No one will ever doubt that this former Army chief of staff has the courage to stand up for our troops and our veterans," he said. In applauding the selection, Brandon Friedman, vice chairman of VoteVets.org, said, "If there are two things everyone knows about Gen. Shinseki, they are that he always thinks ahead to what needs may be down the road, and is not afraid to strongly speak his mind to the president of the United States." Now that Shinseki is working for someone who believes in him, that could well turn out to be true -- no matter how much he kept his counsel to himself in the past. Seriously Jamie, what was your point? You know what the facts support? The facts support an opinion formulated by Gen. Shinseki before the invasion of Iraq, this truth was his truth, what he believed. When the dust settled, Shinseki was correct. Whether you want to call him a "truth-teller" because of this has absolutely nothing to do with deception, but rather perception. If you value honesty and integrity Shinseki did absolutely nothing wrong, he stood by his beliefs and didn't waver; others may have disagreed with him, but he always agreed with himself. he told his truth, and it just so happens that it turned out to be the truth. While Franken is certainly not challenging more total ballots, it does appear as though 60% of Franken's challenges occur in precincts he is currently winning, only 50.8% of Coleman's challenges come from precincts Coleman is winning. (1) Franken is challenging more ballots for himself. (2) Franken is challenging a ton of ballots in precincts where the race is relatively close, and the challenges by Franken, are actually inducing a Franken lead. We'll find out more later tonight. Unfortunately the new challenge numbers do not factor in the withdrawn ballots by both campaigns; there is a disclaimer on the results page explicitly stating that "these totals do not include results for 633 challenged ballots that were withdrawn by the Al Franken campaign." 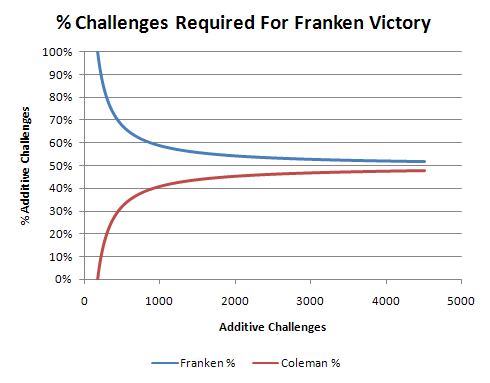 Each candidate increased their challenge count, Coleman by 70 and Franken 112. If we compare today's challenges with yesterday's, it is safe to assume that Coleman's frivolous challenges are also included in today's count; unless of course, Franken challenged 745 ballots today. It now appears as though 62% of Franken's challenges occur in precincts he is currently winning. Coleman's percentage slipped from 50.8% to 49.4% with the inclusion of the newly posted data. Now again using those functions, the following two graphs further illustrate the regression interpolation. The graph below illustrates the regression when applied to precincts of all sizes; Wright County, the largest county finished recounting. The dotted lines represent the two-day-ago regression, while the dashed lines represent yesterday's. The thin lines depict the linear regression while the thicker curvy lines present a quartic regression. The black bars emanating from the x axis represent the number of precincts, statewide with x number of total votes. There are a few straggler precincts between 2600 and 6621 that are not depicted due to the resolution of the graph. Franken still appears to trail by 98 votes but these projections have a large window of certainty. If the extreme is taken, by taking -98 and adding 296 votes, Franken still falls short of the pre-recount deficient of 215. This analysis is valid as of right now (3:06 AM CT 12/4), after 97.58% of all votes have been recounted. Recounting should continue, uninterrupted through Friday. The banks got their bailout, will the automakers be next? I'm sadly inclined to say probably, despite the first bailout's focus on presidential politicking. The forthcoming bailout will likely follow the same path. But it doesn't have to be like that; the auto industry can be saved without writing a blank check. The greatest obstacle to any bailout revolves around the concern of limited monetary resources; is any one entity more worthy than the next? In the case of the big three, a valid argument could probably be made to support the bailout of each company, but a definitive answer does not exist. So what comes next? Two questions must be asked of the situation; (A) Is the company worth saving? (B) Can the company use the money to survive, while providing a service or product that enables all involved to thrive? In the case of the auto bailout, A is essentially unarguable as people need cars, but B presents a dilemma. Is a stagnant, but functional auto industry better than no auto industry at all? Capital Hill seems to be struggling with an answer, but it doesn't have to be like that; the auto industry could be made better. The American Auto Industry has demonstrated a complete inability to compete with the likes of Honda and Toyota over the past decade. Why should the American Taxpayer be required to prop up these failing entities with years of historical incompetence? The truth is, Americans need cars, and at the moment there are only three American options. In the future a fourth company may arise, but in the interim, at least two of these companies must exist; for both diversity of product and antitrust laws. If two of these companies must survive, doesn't it make sense to choose the two companies best situated for future growth and expansion? Here's the plan: a massive auto industry throwdown with the winners splitting the currently proposed $25 Billion bailout. Each company sends a representative to a congressional oversight panel and the rules are decided in committee. The competition is open to any company, any entity, any single person meeting predetermined qualifications and will last 6 months. If at the end of 6 months, the designated objectives are not met, the $25 Billion is not allocated and the companies must survive on their own, or fold. If just one company meets the objectives, the next closest company must also receive funding. All of these contingencies, and others, must be established in advance, by the aforementioned committee. If the participants want to compete, they must be held accountable by providing non-subsidized financing. Banks accepting money from the Troubled Asset Relief Program (TARP) would be required to provide a loan to any interested participant using reasonable lending discretion. Each bank would also be forgiven of the 5% interest rate associated with their participation in TARP, upto the amount loaned to automotive throwdown participants. Essentially all funding for the throwdown would be provided by TARP through participating banks. The Treasury Secretary could then insure these automotive loans, thus removing liability from the banks themselves. Under these circumstances, the banks benefit by collecting interest and the government is not required to spend additional money (assuming the banks are responsible lenders) for at least another 6 months. This scenario presents essentially two possible outcomes; either (1) All participants collapse, or (2) at least two participants succeed and the automotive industry gets, what is hopefully a jump start into economic and technological prosperity. In both scenarios, it is assumed that the banks made reasonable lending decisions, and are consequently unaffected by either outcome. The first scenario presents possible ramifications; I'll start with job loss. Should the jobs created by the autos factor into the bailout decision? There seems to be a growing movement, John McCain included, who foolishly believe once manufacturing jobs are lost, they are gone forever. The manufacturing sector will never disappear so long as there are items to be made. Anybody working, with the right support can be retrained to make another item, so long as there are other items to be made. So how could the government ensure job availability to these workers in the event of an American automotive collapse? I suggest a public works project. Anybody unemployed can go work for the federal government, in their home state building windmills or solar panels under a newly created National Alternative Energy Agency (NAEA). Using the World War II model, a massive industrial complex could be created that generates new jobs and reduces America's strain on foreign fuels. If the government is willing to float a $700 Billion check to the banking industry why wouldn't it spend $647,521,359,420 (PDF) to alleviate America's need for fossil fuel generated electricity. Wasn't the down fall of the auto industry higher gas prices? Doesn't it seem absurd to blindly support a failing industry without addressing the central cause of its failure? Yet it seems all too likely that such a thing will happen. The auto industry has survived on minor revisions for the better part of a decade, but America doesn't need a recolored cozy-coupe, we need a green cozy-coupe.